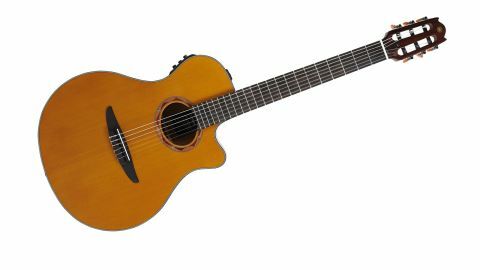 For anyone after a different sound but with steel-string-like playability, this is the place to start: an absolutely superb modern nylon-string electro. Faultless construction. Steel-string playability. Great plugged-in. Nylon strings were developed after the World War II, and outside of the classical world, the nylon-string guitar began to be used by a diverse number of players in jazz, pop, country and, of course, Latin settings - it's essential to Brazilian styles, and you'll doubtless have heard it while watching the World Cup or listening to the latest Rodrigo Y Gabriela album. Along the way, the guitar has changed to cater for players crossing over from steel-string acoustic and electric instruments, creating a modern hybrid that might have nylon strings, but feels and looks more like a steel-string. "From its balanced acoustic sound to its amplified tone, Yamaha really has got this right"
Yamaha's NX range was launched back in 2009 in two flavours. The NCX has the wider classical-style neck, flat fingerboard and 12 frets to the body, while the NTX has a narrower neck, a radius'd 'board and 14 frets to the body. Our Chinese review sample is cheapest, and although the NTX700 has been available from the get-go, this cedar-topped 'C' version was launched earlier this year. It looks like an APX with its modern almost offset outline. There's no soundhole rosette, just some arty marquetry-style decoration, and yes, like the APX, that soundhole is oval. Construction is crisp and faultless. The neck is wider than your average steel-string, of course, but it's very easy to get used to, plus, unlike the classical guitar, we get side dot-position markers and two strap buttons. And although the back and sides are laminate, the top is solid cedar. To generalise, compared with a spruce top, you can expect a slightly softer tonality. Here, beneath its amber-toned finish, it looks damn cool, too. All NX guitars, from this start- up model to the high-end £3k Japanese-made versions, use the same preamp and pickup system. Two ART soundboard transducers sit under the bridge on the bass and treble sides. These pass to volume controls on the preamp so you can set the all-important balance between the lows and highs. Then we have a three-band EQ, tuner (which doesn't mute your output) and master volume. From its balanced acoustic sound - quite subdued in terms of volume - to its amplified tone, Yamaha really has got this right. There's a natural sound with no piezo quack, which records well into your DAW; it loves modern effects, too, and hey, you wanna play it with a pick like Rodrigo (who uses a custom-made version of this very guitar), be our guest.